Posted by Unknown / On : 1:30 AM/ Thank you for visiting my small blog here. If you wanted to discuss or have the question around this article, please contact me e-mail at Gps_86@gmail.com. 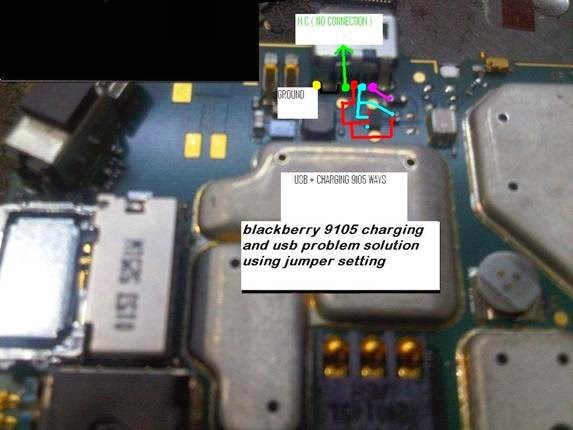 BlackBerry mobile sometimes has a charging and usb connector problem. So we can't charge the mobile and also can't connect the usb to the PC due to this error. We had this problem due to a damaged charging connector or sometimes due to charging the IC. 1. First open the mobile and clean the charging connector. This process is very minor, but essential because the connector is very sensitive. It might not seem like a big thing, but the charging connector should always be clean. A few particles of dirt can make the difference between whether it serves its purpose or fails to work. 2. Then change the charging socket. 3. If the problem still remains then check all track continuity from the charging pin point to the appropriate transistor and on the IC point as shown in the image below. 4. According to the image first check the point 1 shown in green. The point should be ground. 5. Point 2 in the green mark should be blank with no connectivity. 6. Point 3 with the red point should be connected to charging IC leg number 2 using the red jumper line. 7. Point 4 with the sky blue mark should be connected to IC leg number 1 with the jumper and this point should be connected to the other charging transistor also shown in the image. 8. Last and final point 5 shown with the pink mark should connect to the other charging transistor below the charging pin. After all of this is done, the jumper setting, mobile charging and making the usb connection the problem will definitely be solved. During the jumping process we should especially take care of all the nearest components of the circuit board and make sure that they do not become damaged. This is essential because any type of shorting in any component may cause another serious problem. The whole system relies upon the circuit board and if it goes down, then nothing is going to work. The circuit board is a delicate thing; basically it is the heart of the mobile and any disruption whatsoever can throw it off. Also it is easy to break and difficult to repair. That is why you must be extremely careful when doing anything to it or near it. If something happens to the circuit board, you will have to purchase another mobile.